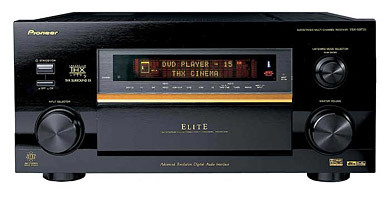 This isn't a movie prop from Men In Black III, it's a high-end SACD player from Japan. Shanling is known for their retro looking tube amps, tuners, and CD players and the new CD-T200C is a perfect example. It can output in full digital using its custom made Burr-Brown D/A chips or via the high-quality vacuum tube section which glow a nice orange color. The tube circuitry gives the player a smooth, natural sounding quality. The price for one of these master pieces... about $2000. Could this be the best A/V integrated receiver to date? I'm thinking so... Pioneer has done good with the VSX-59TXi, one of the key new features is the playback capability of Windows Media Audio 9 Professional encoded media. This makes hooking up your HTPC and playing back WMVHD files a cinch. All you need to do is plug the USB cable to your computer and you can start enjoying true 6-channels of audio. The 59TXi still has the i.LINK digital interface for firewire connectivity as well as all the inputs and outputs you'll ever need. It meets LucasFilm's THX® Ultra2 certification and all the other digital decoding formats common with high-end receivers. The remote was updated, a much needed update, it's now more like a Phillips Pronto. This flagship unit is loaded with updates, one more notable update is the advanced version of their Multi-Channel Acoustic Calibration Circuit (MCACC), it identifies and evaluates each speakers frequency response and it even provides PC connectivity so that graphic representations of your room’s unique acoustic signature can be visually seen. Aiding in where the most calibration should be applied. This receiver should definitely be on your wish list. 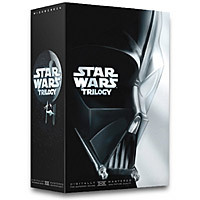 The wait is almost over, Buy.com has the Star Wars Trilogy on DVD for pre-order. The product features doesn't specify anything extra special... it doesn't seem like George Lucas is updating them in this release (which may be a good thing). The movies will be featured in the standard widescreen aspect ratio of 2.35:1 with Dolby Digital 5.1 audio. Of course, the 4 discs will be THX Mastered. I still have a LaserDisc player and my prized boxed trilogy set... I'm interested to see how better of a picture the DVD release will be. Release date is scheduled for September 21, 2004. If you're a home theater nut like myself, you'll love the quality and service CinemaWise Productions provides. 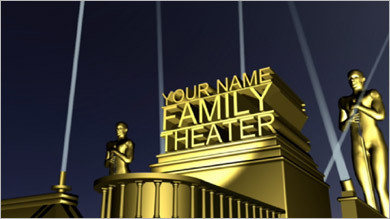 They can create a custom high definition home theater intro for you in 5.1 surround sound. Perfect for when you are entertaining guests... They also have a varity of intros to choose from, as well as trivia and ads. It's amazing how big Monster Cable has become over the years. Ask anyone what they think of Monster Cable and they will probably tell you that is it's a highend cable manufacturer or very good quality cables. It's always recommended anytime you purchase something from any A/V store. Why!? Why do people live the Monster Cable lie? I always find it humorous that a sales person can recommend a $50 cable to someone that just bought a $100 DVD player. If you want to see how the 'inventor' of Monster Cable lives, you need to check out this article over at Connected. If you're looking for real broadcast quality interconnects, check out Bluejean Cables... they use Belden or Canare cables and they are true 75ohm, unlike Monster cables that are up to 4x the price. I guess that's what great marketing can get you in life.